Never forget the milk (or anything else) again. 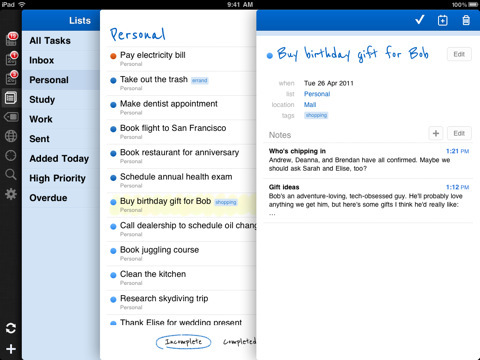 Remember the Milk (RTM) is a free to-do list management app for the iPhone and now the iPad too. Using Remember the Milk app is free although push notifications cost you $25/year for the pro version. As Apple has just announced their free iCloud service with iOS 5 featuring free push notifications, we probably expect RTM to start offering some sort of free push notification option at some point. With over 2 millions users, the Aussie developed Remember the Milk has been around for a very long time having originally been on the iPhone before the App Store, as a web based app. RTM now offers offline as well as online list management features. Using Remember the Milk is empowering since it not only syncs over the air with Microsoft Outlook, iCal, Gmail, Google Calendar, Twitter, and more. You now also get a full featured iPhone and iPad app. Items in RTM can have their own priorities, due dates, time estimates, tags, and they may be setup as repeating tasks. Tasks you create in RTM may contain many unique metadata properties like Google Maps for GPS locations. Postponing tasks is allowed and the app remembers how many times you’ve done so. You won’t miss any to-dos with a wide range of notification options including SMS, IM, and email, plus push notifications in the optional pro version. Above all this, Remember the Milk runs fast, is easy to setup, get started and use on a daily basis. The iPad version of Remember the Milk is designed very similar to the Twitter app on the iPad and is quite effective on the large screen. It will be interesting to see how RTm and other to-do apps do after the official Reminders app from Apple is released with iOS 5 later this year. AppSafari review of Remember the Milk was written by Joe Seifi on November 3rd, 2007 and categorized under App Store, Calendar, Featured, iPad apps, Notes, Productivity, Universal, Utilities, Webapps. Page viewed 5819 times, 2 so far today. Need help on using these apps? Please read the Help Page.